WAUSAU, Wis. (AP) — Few crops compare to American ginseng. The beige root resembles a cross between a carrot and a turnip and above ground a combination potato and strawberry plant. The complexity, vulnerability and price of ginseng, however, are unmatched compared to most produce grown in Wisconsin soil. This is a crop that can be grown only once on a plot of land, and it takes four to five years to go from seed to harvest. Weekly sprayings are needed to prevent disease and fungus. Threats are constant from too much rain, early frosts, late snows and wild turkeys that damage the fragile plants while scratching for insects. Ginseng growers are challenged by volatile prices, land availability, labor shortages and the need for specialized equipment that can be expensive to buy and in some cases must be custom-built. Product fraud is an ongoing problem because Wisconsin growers produce a higher-quality, more-expensive type of ginseng compared to what is grown in Canada and China. But there is no better place in the country than the 11 central Wisconsin counties to grow Panax Quinquefolius. The root is valued for its high levels of ginsenocide, the active ingredient that is used in teas, cooking, crushed into pill form or used as part of a medicinal concoction. A recent study by Mayo Clinic and North Central Cancer Treatment Group researchers found that Wisconsin ginseng is effective in boosting energy levels in cancer patients. The rural landscape here accounts for 95 percent of U.S.-produced ginseng. About 70 to 80 percent of the crop, after it is dried in kilns, is packed into barrels and exported to Asia, where the ginseng is highly coveted for its medicinal properties, which include reducing fatigue and increasing virility. Dried, cultivated ginseng can sell for between $65 and $85 a pound. Much older wild ginseng, scavenged for in the woods, can sell for more than $500 a pound. The ginseng farms, though, are easy to spot with their man-made structures of black mesh or wood lattice suspended on poles and cable 8 feet in the air to create the shade needed for the plant’s survival. But almost 20 years after more than 1,500 farms produced 2.2 million pounds of ginseng, farm numbers and the annual harvest have been drastically reduced as a result of a flood of product from China and Canada. The two countries combine for annual harvests that approach nearly 10 million pounds. The good news for Wisconsin ginseng growers is the growth over the last four years, increased marketing and consumers demanding to know their food’s origins. The first era began in the early 1900s when brothers Walter, Edward, John and Henry Fromm began growing ginseng southwest of Merrill to support their silver fox business, the Wisconsin State Journal (http://bit.ly/1LqnZ2N ) reports. After World War II, demand continued to expand and ginseng farms grew near Wausau. The second golden age was from 1960 through the mid-1990s when both the price and demand for American ginseng continued to increase. In 1992, exports hit $104 million according to a 2009 study by Len Cheng and Paul D. Mitchell in the Department of Agricultural and Applied Economics at UW-Madison. But after a peak in 1996, sales of state ginseng plummeted to $20.8 million in 2005 due to a decline in world market prices. The economics forced many farmers out of the business but production has slowly increased. Dave Schumacher, 42, grows and buys ginseng from an office in downtown Marathon City. Most of his products consist of sliced or whole roots, many sold in 4-ounce packages ordered through the company’s website. At one time, he farmed 40 acres of ginseng but now has just over six acres and harvests about two acres a year. At Hsu Ginseng, 200 acres are dedicated to ginseng. In 1974, Will’s father, Paul Hsu began buying ginseng and sending it to family and friends. In 1978, Paul, who worked as a social worker in Fond du Lac, moved the family to Marathon County to begin growing the root. The company’s operations now include branch offices in Taiwan, Canada, Los Angeles, San Francisco and New York plus a retail store in a busy part of Hong Kong known for its herbal and seafood trade. Last year, Hsu spent $1.6 million to build a 39,000-square-foot facility at its headquarters near Wausau that includes a massive cooler. Bins of freshly harvested ginseng are stored in the cooler and later washed, dried in kilns, and packed into barrels to be shipped overseas. “The hard part here is that it’s getting harder to farm. It’s getting more expensive to farm, and there just isn’t a generation (coming up) of folks who want to or know how to farm this product,” Will Hsu said. The labor issues are also tight during a three-week window, typically in September, when seeds are harvested. The process, similar to picking strawberries, is done by hand. It takes about 100 pounds of seed to plant an acre of ginseng. A typical worker can pick 2 pounds of seed an hour. State ginseng workers harvest about 60,000 pounds of seed a year. Seeds picked this year are stratified in sand in coolers over the winter and then planted next spring. They won’t sprout until 2017 and will be ready for harvest by 2019 or 2020, Sandquist said. Ginseng Board of Wisconsin officials say that if prices remain stable and the weather cooperates, the state could harvest 1 million pounds of ginseng by 2017. 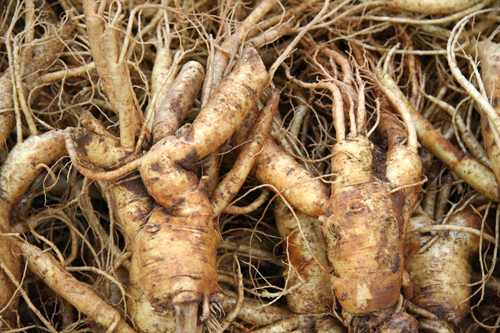 In 2014, state farmers harvested 720,000 pounds of ginseng, worth $52 million. State farmers last surpassed 1 million pounds in 1999, according to the state Department of Trade & Consumer Protection. The 2015 harvest is expected to be about the same as or even slightly larger than 2014, but the impact from a late May frost on the crop won’t be known for likely a few months, said Tom Hack, Ginseng Board of Wisconsin international marketing director. Hack works hand-in-hand with the Ginseng & Herb Cooperative, based near Marathon City, to market Wisconsin ginseng to U.S. and Asian sellers. The work includes trips to China, Taiwan, Hong Kong and China with domestic trips to the East and West coasts. “We’re just getting more and more inquiries,” said Jeff Lewis, general manager of the 60-member co-op. Hack is also trying to convince the federal government to ease restrictions on ginseng exports. Because ginseng is classified as endangered, products like whole and partial roots and slices are subject to additional inspections and permits, which add costs for the consumer. Ginseng in a form that does not resemble a ginseng plant or root, like tea or a pill, are not subject to the increased scrutiny.